Many socio-economic and environmental trends shape the evolution of freight and passenger transportation, especially within an enormous geographic region such as Europe. The European Union (EU) has launched a major project to build a roadmap of these trends up to 2030, that will ultimately be used to develop a toolkit for policymakers. The Action Plan for the Future of Mobility in Europe (MOBILITY4EU) project kicked off at the beginning of this year and will run until the end of 2018. 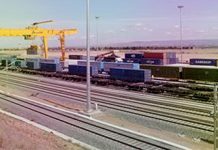 The Zaragoza Logistics Center (ZLC), Zaragoza, Spain, is managing the freight element of the project. “We want to create a common vision for how European freight and passenger mobility will develop over the period and set a path for what should be achieved from a policy perspective,” says Carolina Ciprés, ZLC Director of Research Programs. It’s a mammoth task. The project partners represent a wide cross section of interests. Numerous experts from various disciplines are helping the project team to sift through trends, and identify which ones are relevant and their likely impact. The Multi-Actor, Multi-Criteria Analysis Method (MAMCA) for evaluating transportation projects is being used to assess the possibilities. MAMCA takes account of a broad range of factors including societal as well as economic outcomes. Multiple alternatives can be evaluated both qualitatively and quantitatively using the seven-step MAMCA method. The method is reinforced by a visualization-based process for mapping stories. The first step is to define the problem and identify the alternatives. “We are being careful to distinguish between a goal and a trend,” says Ciprés. A goal might be achieving a certain reduction in carbon emissions, whereas a trend is developing transportation solutions that are environmentally sustainable. Other examples of trends include the growth in e-commerce, new wealth distribution models, the arrival of driverless vehicles, and the emergence of an uber-like economy. The team is currently honing the list of trends that pertains to the mobility of freight and passengers. Having defined its areas of focus, the project will bring participating stakeholders into the picture. Including stakeholders in the evaluation process early on is an important step in the MAMCA methodology. The participants will identify the most likely scenarios based on the selected trends, and develop a common view of how the top-ranked scenarios will play out in the real world. Implementation is the final step in the MAMCA process. The team will formulate an action plan for achieving the outcomes they have modeled. This plan will include a blueprint for the implementation of a sustainable and continuous European Transport and Mobility Forum after the project has been completed. An example of such a forum could be a new European Technology Platform for transportation. The sheer number of experts from different countries that are supporting the project is also unusual, but necessary given the scope of the work. Moreover, this diversity of expertise brings many viewpoints and opportunities for fresh thinking. Managing the vast body of knowledge is a challenge. “We have to develop a consensus view that is also neutral; a huge number of stakeholders are involved and the findings must be unbiased,” Ciprés says.